Squats are an excellent way to strengthen the glutes, hamstrings, and inner thighs. A great exercise series that works effectively for lower extremity stability. It is great for runners, soccer players, lacrosse players, skaters, skiers; just about everyone. Start: You will need to make a loop and place the knot of the loop in the door. Close the door so that the band is secure. Take a few steps away from the door with the band placed around the right ankle (as shown) or your non-involved leg. Face the door, or referred to as "north," and with control slowly kick back your leg. Make sure your abdominals are engaged and that your hips stay level. You will feel your standing leg doing most of the work. Turn 180*, facing south, and proceed to kick forward with a slow and controlled motion. Next turn east or west, and kick the leg either out or in. Make sure to turn another 180* to work the opposite motion. To make this easier, you can tap your toe each time you kick back and progress to kicking back without a toe tap as your balance and stability improves. You can also place the band above your knee, onto your thigh, to avoid any torque in the knee. Remember to keep a soft bend in your standing leg. Repeat 3x10 each direction and each leg. The exercise can help you achieve better use of your shoulder by improving its range of motion. To Start: Find an open wall or door jam. Facing the wall slowly walk your fingers up the wall. You walk up as far as you can while maintaining the space between your shoulder and your ear. This may decrease how much range of motion you achieve initially but it will your mechanics correct and decrease the chance of developing compensations. Once you have the reached your maximal height, hold for 3-5 seconds and then slowly walk your fingers back down. Repeat this for 10 repetitions. Help keep your muscle tone and awake after having shoulder surgery. Isometrics ask muscles to fire but without moving the joint. Start: Standing near a doorway or wall with your elbow bent. External Rotation (ER): Stand with the back of your wrist against the wall. Keep your wrist neutral as you apply a force externally as if your palm was going away from you. Start with 20% force and slowly work up to 80%. Hold for 5-10 seconds for 10 repetitions. Internal Rotation (IR): Stand on the other side of the wall with your palm facing the wall. Apply a sub-maximal force without eliciting pain.Start with 20% force and slowly work up to 80%. Hold for 5-10 seconds for 10 repetitions. Abduction: Stand with your elbow against the wall. Apply force through the elbow.Start with 20% force and slowly work up to 80%. Hold for 5-10 seconds for 10 repetitions. Adduction: Step away from the wall and place a towel between your arm and your thorax (ribcage). Apply a force as if you are squeezing your side. Start with 20% force and slowly work up to 80%. Hold for 5-10 seconds for 10 repetitions. Flexion: Face the wall and apply force into the wall through your wrist keeping your wrist in neutral. Start with 20% force and slowly work up to 80%. Hold for 5-10 seconds for 10 repetitions. Extension: Face away from the wall and apply force through the elbow. Start with 20% force and slowly work up to 80%. Hold for 5-10 seconds for 10 repetitions. These exercises are great exercises for runners to do while dealing with plantar fasciitis to strengthen intrinsic foot muscles. This exercise focuses on the muscles that stabilize your back. 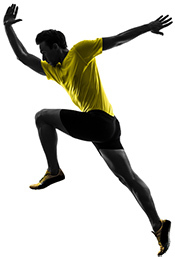 A stable back is the key to controlled movement and needed for every activity and/or sport. This exercise requires core activation and stabilization with extremity movement. The challenge is to keep your back and pelvis straight and still by engaging your core muscles. The exercise starts with your arms and as you increase your strength and stability you can progress to legs, then combine the two. Start: On hands and knees directly under the shoulder and hips, respectively. You can place a ball or dowel on the small of your back as a tactile cue. Tighten your abdominals. With your core engaged lift one arm up while keeping your back perfectly still. Return to start and perform with other arm. Repeat for 10 reps 2-3 sets. Progression: with your core engaged, extend one leg back while keeping your back and pelvis perfectly still. Return to start and perform with other leg. Repeat for 10 reps 2-3 sets. Final progression: With your core engaged, extend one arm and the opposite leg while maintaining a straight spine. Return to start and perform with the other arm and leg. You want the motion to be slow and controlled. You will need to Log Roll to get on to your back and bend your knees to a comfortable position. Think of your pelvis as a bowl and roll your pelvis back, "spill it out the back," then roll your pelvis forward, "spill it out the front." This movement should be pain-free.Repeat for 10 repetitions. Next you can bring one knee to your chest, giving a gentle squeeze to the knee to get a pain-free stretch in your back. Perform with both legs but making sure you move in a slow and controlled manner. Hold each stretch for 15 seconds. Perform 2-3 times per leg. A perfect stretch that will address tightness in the back of your leg. The first stretch addresses the superficial muscle- the gastrocnemius. Position yourself near a wall or counter top, place one leg back and gently lean into the wall to take up the slack. Make sure that your toes are pointing forward and your heel is on the ground. Hold this for 30 seconds. The next stretch is for the deeper calf muscle- the soleus. To do this, you will need to bring your back leg closer to the wall and get into a small knee bend while keeping your heel down. Lean into the wall. You will feel this stretch closer to the heel or in the Achilles tendon. Hold for 30 seconds. An alternative is to place your toes onto the wall and then bring your body closer to the wall. You may experience a stretch in the foot as well. Hold for 30 seconds. Remember to perform these exercises on both legs. Starting position: on all fours. Ending position: Reach arms all the way forward, while sitting hips onto your heels into comfortable stretch position. Modifications: you can put a yoga block under your hips to decrease pressure on your knees. This is a great drill that helps you work on power and explosion. Stand approximately one foot length behind the bench. Using your arms and legs, jump on to the box. You should land quietly and with your knees in line with your 2nd and 3rd toes. You can step down or jump down and continue to repeat. If you increase the speed, you will notice that your heart rate will increase thus giving you a cardiovascular workout as well. Perform 3x10 or for 1-2 minutes segments.